Le Vele di San Ruffino, or The Sails of San Ruffino, is what the Regatta was called this year, due to a change of sponsors I believe. Anyway, whatever the name, it was once again a great success. 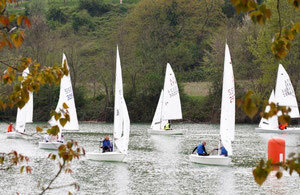 Our guests from Ferrara and Rimini were sailing in the regatta. One of them told me that it was such a pleasure to be part of it because the area was so beautiful and because they were welcomed so warmly and generously by the community. The first day was the heats and that night, all the sailors and their families were given a guided tour of Smerillo and it's Museum of Contemporary Art followed by dinner at Ristorante Le Logge. The day of the regatta was 25 April, a holiday here, the weather was good and the lake side was covered with lots of interesting stands - papermaking, free Shiatsu massage, ceramics with the artisan at work, Aria's handmade bags, hats from Montappone, honey, jams (including a delicious chilly one), donkey rides and much more!